by Peter S. Kimmel, IFMA Fellow, Publisher FMLink — February 26, 2018 — In response to the recent tragic events in Parkland, Florida, where 17 people were gunned down in Marjory Stoneman Douglas High School, FMLink has compiled this report on being better prepared for an active shooter situation. The report is based on research from a wide variety of sources. While the tragedy at Parkland is not the largest in US history (see Table), it seems to resonate with more people in the United States than many others, as if the time now has come when people must take action. These include everyone from the President of the US and Congress; to state governments; to academic deans, superintendents, chancellors and principals; to hospital administrators, and to many more. And we must not forget the role of the facilities manager (FM) — a key figure to implement and oversee any plans for a specific facility. All the shootings took place in or from a facility, where someone with firearms entered a facility to begin a senseless killing rampage. Most facilities managers have thought long and hard about what can be done to prevent such scenarios, but sometimes what needs to be done cannot be done, perhaps because of budget constraints, building constraints, staffing, or other reasons. If a shooter does enter a facility, what can be done during the attack to minimize the casualties? What can the facilities manager do to make sure the attack is contained as much as possible? Should there be frequent drills and training of key staff? Who should organize these efforts? Many of these questions will be addressed in the paragraphs that follow. FMLink will focus on those ideas that relate to facilities and facilities managers. It is our hope that the ideas below will help mitigate the frequency of and losses from any potential future events such as those that occurred in Parkland. First, we’ll look at both what can be done within a facility to reduce the chances that it will have an active shooter incident, and to minimize the toll it takes, should there be a shooter who enters the facility. Preparation is particularly important because active shooter situations are often over within 10 to 15 minutes — long before help arrives. Note that many recommendations from our sources are not provided in this article — rather, we are focusing on items that impact facilities managers. FMLink encourages its readers to go to the links provided and fully research all the suggestions, passing suggestions along to the appropriate people in their organization. Many facilities managers are aware of a good number of the recommendations. Some don’t have the time available to make them happen; others can’t get their management to make it a priority, whether for time or for budget. What happened in Parkland should be a wake-up call-to-action for FMs and their management. At the end of this special report, we offer a suggested action plan for the FM. Facilities managers will see that they can play a large role in keeping our facilities safe. 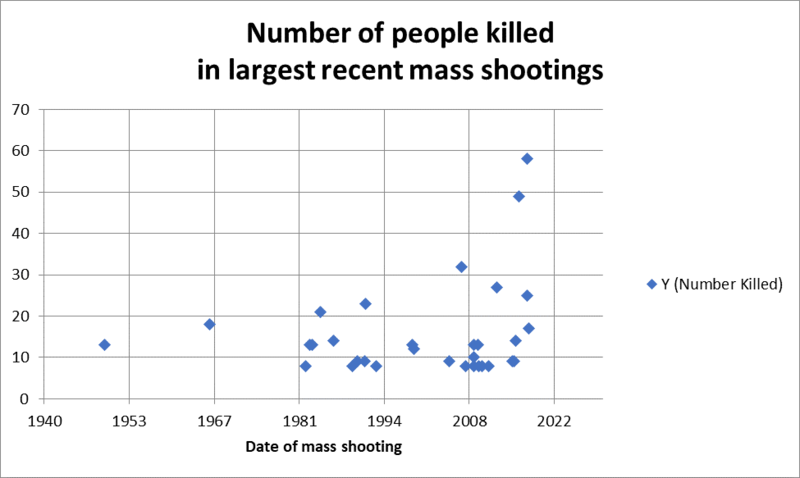 As shown in Figure 1, since 1982, the number of mass killings of eight or more people has increased dramatically. Since 2009, the number of people killed in mass shootings has also increased; four of the five mass shootings of 25 or more people have been since 2012, and the fifth one was in 2007. Clearly the problems have been escalating in recent years. Furthermore, the four used semi-automatic rifles, which clearly had an impact on the loss of life. Figure 1. The number of people being killed in mass shootings has increased dramatically in recent years, as has the number of mass killings. Provided courtesy of FMLink. Click image to enlarge. Many years ago, after many lives had been lost in fires, someone came up with the idea of scheduling regular fire drills, especially in certain types of facilities, such as schools. As a result, many lives have been saved from fire. The facilities manager is in a unique position of knowing the facility better than anyone else; the FM also knows what is feasible to do, and can request approval for and secure whatever additional resources and equipment may be needed. The FM is also trained on how to assemble a variety of resources and have them work as one well-oiled machine. It therefore is essential that the FM be proactive. What do the experts say to do in active shooter scenarios? Campus Safety magazine has identified 20 strategies to help reduce the threat and killings from an active shooter on campus settings. Most of these apply to any facility, not just educational facilities. Many involve no more than awareness and training, so they are very affordable and feasible to implement. To see the full list as well as a detailed description of each strategy, go to the “20 Active Shooter and Active Killer Prevention Strategies” page. Campus Safety also shared a link to “California State Releases Active Shooter Safety Training Video,” produced by California State University at the end of 2017 with input from campus police chiefs. The eight-minute video was distributed to all 23 campuses and offers guidance applicable to all types of facilities. The booklet also states that evacuation instructions should address the needs of individuals with special needs and/or disabilities. While much of the booklet contains information for the facilities manager, both directly and indirectly, it also includes valuable information for Human Resources (HR) and managers, including a section on indicators of potential violence by an employee. In addition to the booklet on how to respond, DHS makes available a handy Active Shooter Pocket Card (only 2 pages), which summarizes how to cope and respond in the event of an active shooter’s presence in a building. Take note of the two nearest exits in every facility. If you are in an office or room, stay there and secure the door (note: the FM should make sure doors of rooms where people may congregate can be secured from the inside). RUN—Identify in advance escape routes; leave belongings behind; if you are within sight of the shooter, run in zig-zag patterns, looking for cover. If on a higher floor, take the stairs, not the elevator; if on a lower floor, be prepared to take a jump through a window. HIDE—Stay out of the shooter’s view; lock doors; silence cell phones and pagers. Rooms near the elevator core are ideal, especially if they can be barricaded, as these rooms often have load-bearing walls that bullets cannot penetrate. FIGHT—As a last resort, and only if your life is in danger, attempt to incapacitate the shooter. Law enforcement groups do NOT recommend pulling fire alarms, as this causes more panic and brings people out into the hallways, which is where the shooter would like to see them. DHS has put together a video of how to respond to an active shooter: Options for Consideration Active Shooter Preparedness Video, available online. The video is nearly eight minutes long and would be very useful to show all staff, including those who have special needs. Another strategy is for the facilities manager to identify escape routes for each room and post them, just as is done for fire evacuation in hotel rooms. Active shooter drills can reinforce where to go and what to do. The National Fire Protection Association (NFPA) is finalizing a new standard, NFPA 3000, a standard for preparedness and response to active shooter and/or hostile events. It has been working on this for a while, and it just closed for comments on February 23, 2018. There are still many more steps until the final version is released, but even the draft is a very useful document. The purpose of the NFPA 3000 is to identify the minimum elements necessary for organizing, managing and sustaining an active shooter program to reduce the risks and impact of a shooting incident on an organization. NFPA has made available a Fact Sheet on NFPA 3000, as well as the full draft text of NFPA 3000: Standard for Preparedness and Response to Active Shooter and/or Hostile Events, both available online. FEMA has put together several courses about active shooters, many of which are available online through their Emergency Management Institute and the National Institute Management System (NIMS). For more information, go to the National Institute Management System (NIMS) page and search for “active shooter”. The Washington Post has compiled an excellent five-page guide on what to do if a gunman opens fire in your building. It has very clear graphics and is appropriate to distribute to all building occupants as well as those running active shooter drills. Many of the above ideas can be incorporated into developing a plan and a training program, as well as orientation of new employees. Be on the lookout for anything different in terms of people’s behavior as well as anything out of place in the facility. The latter includes items left in the hallways, furniture that has been moved, etc. Changes in behavior should be observed by all school staff, but as FMs regularly walk through the facility, they can play a key role here. Review the facility to see what can be done to make it more secure; include both the building and its perimeter. Train staff to recognize indicators of a potential shooter. Identify key personnel and staff who may need to take action should an active shooter enter the premises; identify the actions they may need to take. Develop procedures for all to follow. Train all staff. Determine whether any additional security staff should be hired. Determine whether any additional security equipment should be procured (camera, sensors, keypads, etc.). Determine whether any facility modifications, such as means of egress or ways to secure doors, should be planned. Schedule regular drills and training exercises (with mock active shooters) so building staff and other occupants are prepared; local law enforcement can be an excellent resource in designing training exercises. Develop an initial training program for all occupants and staff of the building and incorporate training into the orientation program for new occupants and staff. Develop policies and procedures to admit visitors to the facility, including delivery and service personnel; these encompass checks of identification, screening requirements, needs for alerting security about expected visitors, etc. Schedule an annual review of the plan and modify it as necessary. The suggestions above will vary depending on many factors, such as size of facility, number of occupants, ages of occupants, building and site constraints, and many other variables. However, they should not be affected by availability of staff time or budget. Human life is too precious for that. If you have ever wanted to instantly block a line of sight through a glass partition in an emergency, you need to see this solution from Modernfold August 13, 2018 In "Products and Services » Building Products"
Need to identify individuals in crowded places? This “re-identification” technology promises accuracy as high as 90% — even from behind February 22, 2019 In "Products and Services » Security"